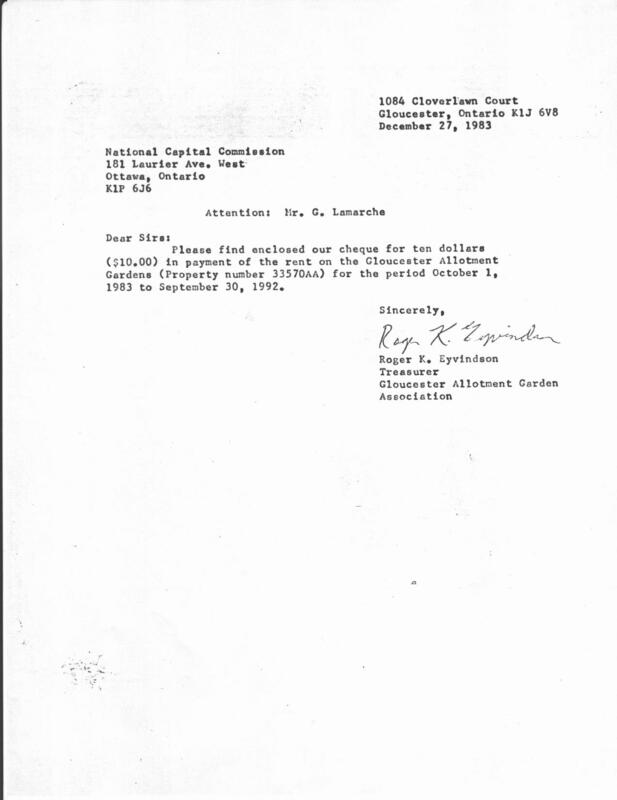 During the early 1970s, the NCC's east-end allotment garden program was renting nearly 700 plots. 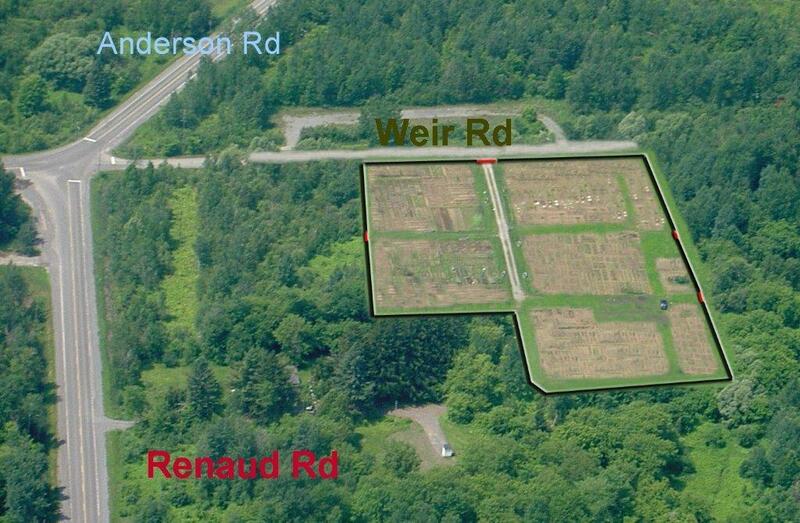 The gardens were spread out at several locations – just south of Orient Park Dr, north of Renaud Rd, east of Weir Rd and west of Anderson Rd. However, by the winter of 1981, plot rental in this area was down to only 200 gardens – a similar decrease in demand had occurred throughout the national capital region, as well. Most of the "baby-boomers" now felt they did not have enough time to garden. 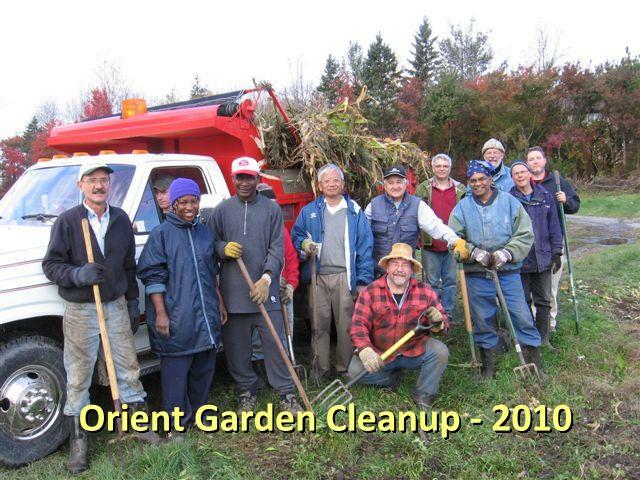 Luckily, though, a few gardeners at the Orient and Weir Rd sites still wanted to grow some organic vegetables, so after a few meetings during the winter of 1981 between some volunteer gardeners and the City of Gloucester, the City agreed to maintain the program for the 1981 season if the gardeners would organize and manage the gardens from then on. While the Association had received about 200 gardens from the NCC, not all of these plots could be rented because of the decreasing demand. Thus, in 1982, a Publicity Director was added to the Board. 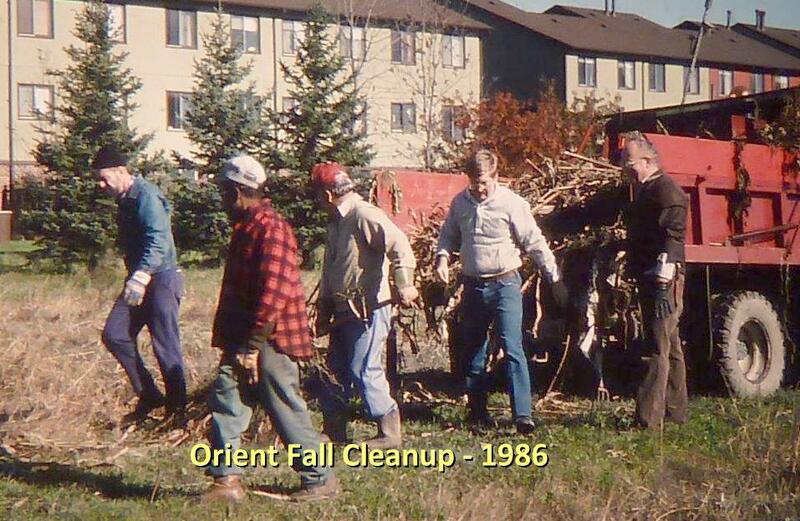 By 1983, Maintenance Directors were elected for both the Orient and Anderson sites. 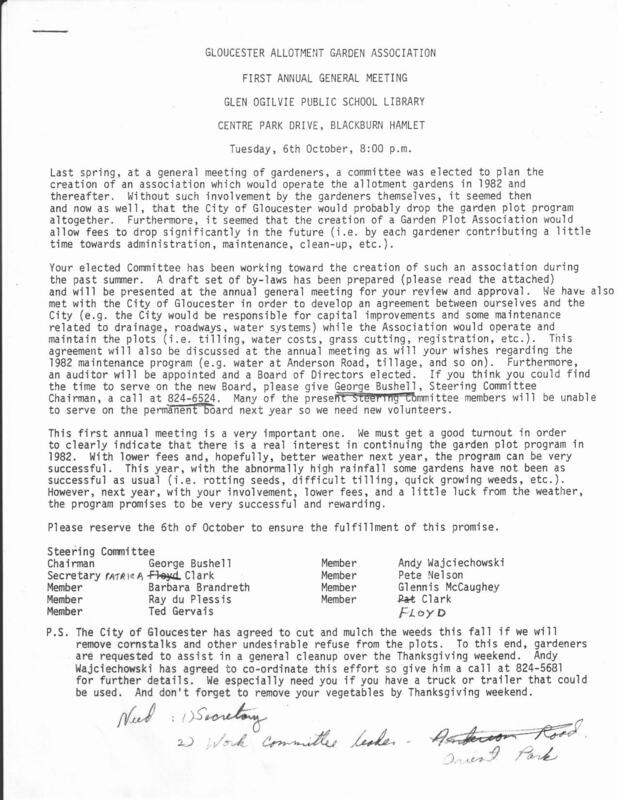 In order to call existing gardeners each spring so they would sign up again, a Communications Director was added to the Board in 1985. Then in 2005, to keep up with the changing times, the last new Director position to-date was added to the Board – a Webmaster. Over the years, many, many gardeners volunteered to serve on the Board and hundreds more helped with such activities as staking, grass-cutting, clean-up and special upgrading projects. 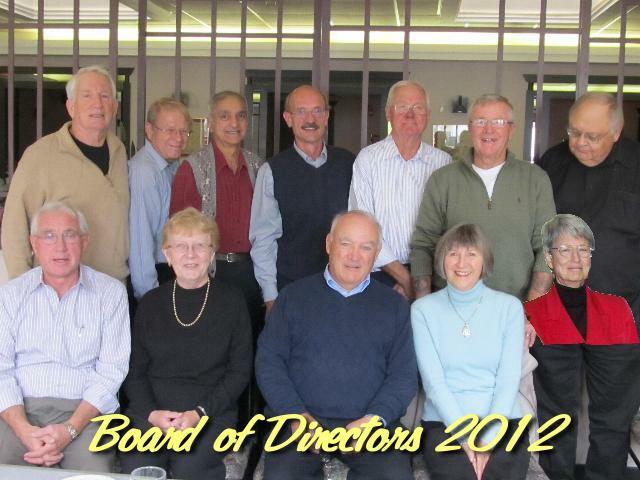 click here The minutes of the first AGM and the first Directors meeting are recorded here. It is interesting to compare GAGA expenses in the first Financial Statement and also a copy of the lease with NCC of $10 for 10 years. Many changes have occurred since 1981. 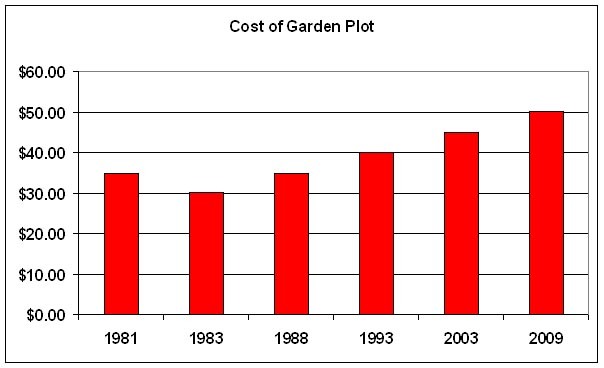 Perennial plots were introduced in 1982. 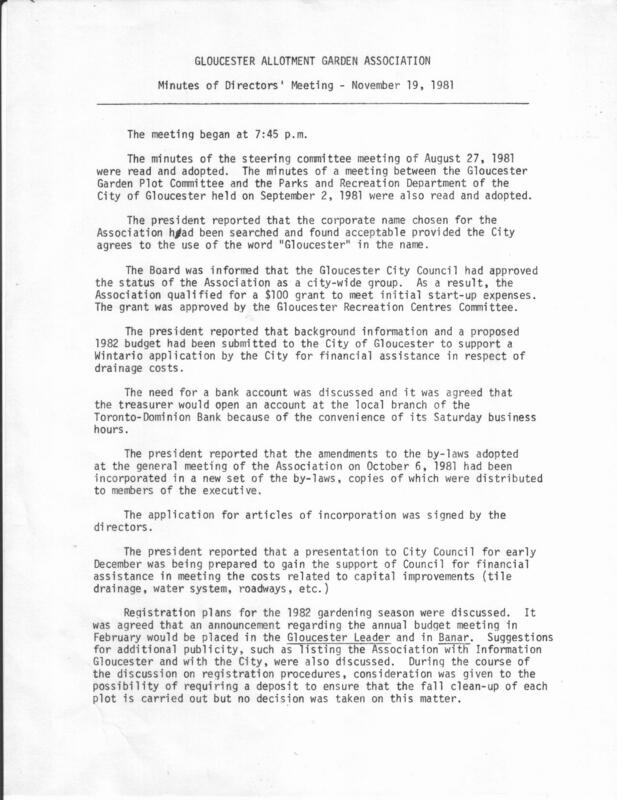 Improved drainage was installed by the City of Gloucester at the Orient site in the fall of 1983. Access to the Orient site was initially from the parking lot of the Blackburn Arena but was soon changed to the current location located at the easterly end of Orient Park Dr. 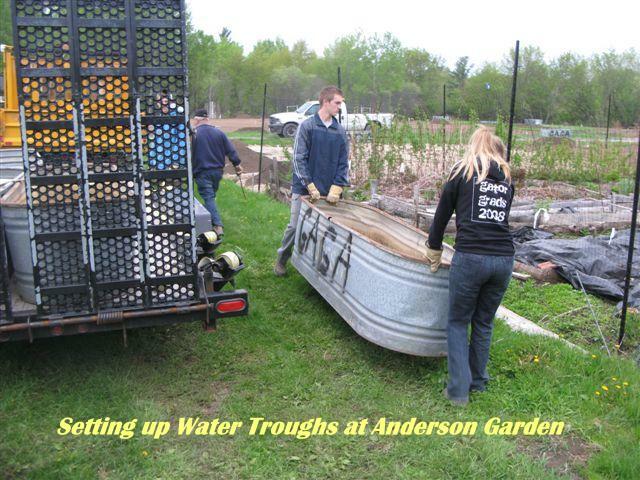 Many of the water troughs at the Anderson site were stolen soon after the Association's start-up but the City of Gloucester replaced them and garden volunteers painted a large GAGA logo on all of the troughs (which discouraged any further thefts). The Association, with the assistance of the City, started supplying compost to garden plots soon after start-up. 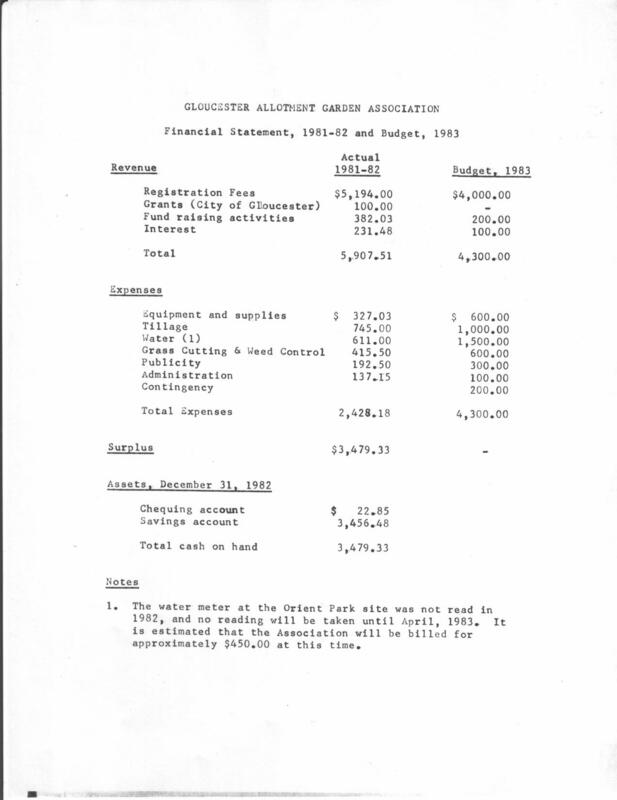 Garden fees for a full-sized plot were initially set at $25. After a couple of years, rates were reduced to $20 for a full-sized plot. However, with the high inflation rates of the 1980s and the stationary plot rental numbers, prices had to be increased slightly over the years. Nevertheless, full-sized plot rates for those who volunteer and register at the annual AGM meeting are still only $45.00! One of the biggest challenges at the Anderson site over the last 30 years was the surge in wild animals living around the garden plots. Deer, racoons, rabbits and groundhogs started to eat almost all garden produce by about 2005, and many gardeners at this site started to give up their plots. 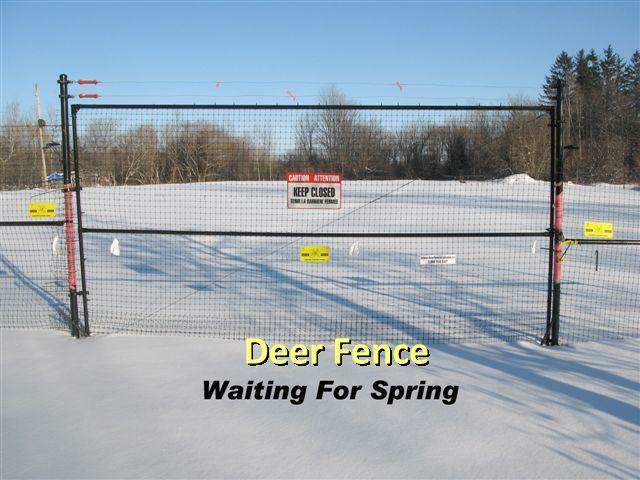 Luckily, at that time the local Councillor, Rainer Bloess, the City of Ottawa staff and Just Food provided a grant that allowed the Association to construct an animal protective fence around the site. Since that time, plots have actually been added to the site and all are being rented. 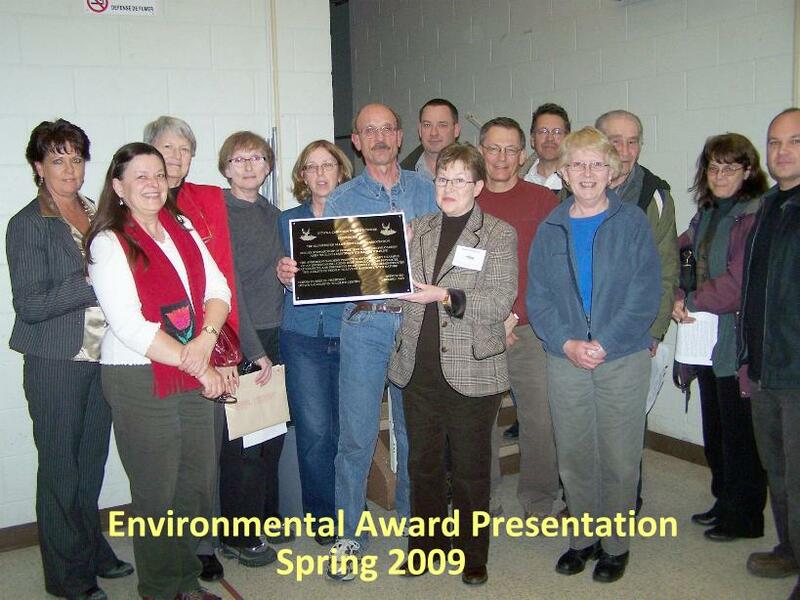 In addition, The Ottawa-Carleton Wildlife Centre presented the Association with an Environmental Award for adopting a solution that allows both gardeners and wildlife to exist peacefully together. Demand has also increased at the Orient site during the last few years and additional plots were added to this site in 2010 and 2015. The Association's total plot numbers have increased from 200 in 1981 to 382. 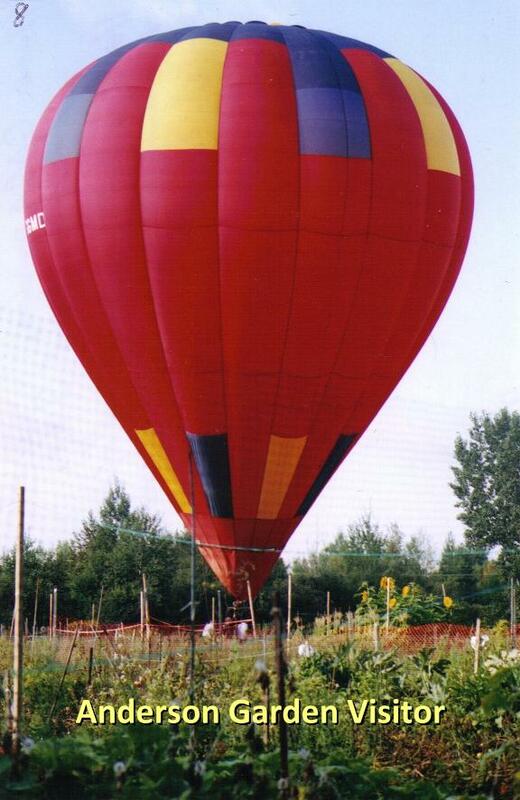 The Association is responsible for the operation and maintenance of the gardens. It must perform the registration, till the plots, complete the staking, transport and distribute the compost, cut the grass on pathways and perform the fall clean-up. The City maintains the access roadways, blows the water lines at Orient each fall, stores the Anderson water troughs, supplies the compost, and funds one-time upgrades and maintenance projects. This partnership has worked very well, and all gardeners hope the next 30 years will be as enjoyable and successful as the last three decades have been.